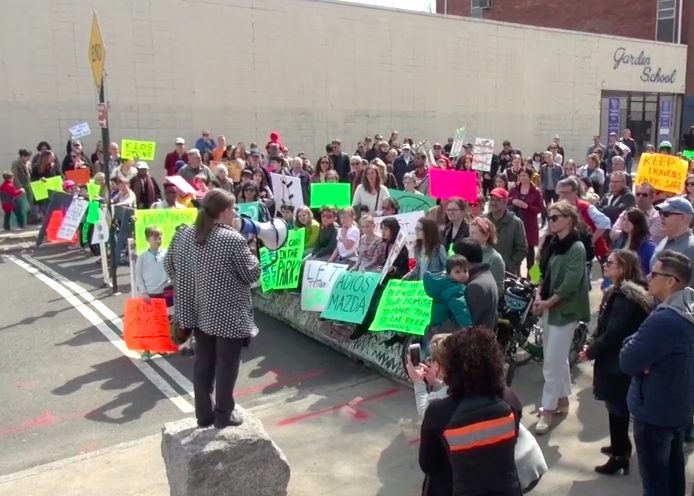 An overflow crowd came out on Monday night to plan a strategy for getting the city to make good on its promise to turn 78th Street in Jackson Heights into a park. Photo: Clarence Eckerson Jr.
Jackson Heights pols, including Council Member Daniel Dromm and Assembly Member Catalina Cruz — who represents the neighboring district — stood with the residents to demand the city make good on its promise to ban cars on the whole block, following a rally on the block last month. Hundreds also rallied last month for the city to make good on its promise to close all of 78th Street to car traffic. Photo: Clarence Eckerson Jr.
“A city government that is allowing and enabling this to happen, in an age where we are talking about Vision Zero — it is mind-blowing that we have to be here today to combat this,” said Shekar Krishnan, a member of the Jackson Heights Green Alliance, finding particular irony in the city putting cars above people’s lives in a community that’s already held too many vigils for kids killed by reckless drivers. 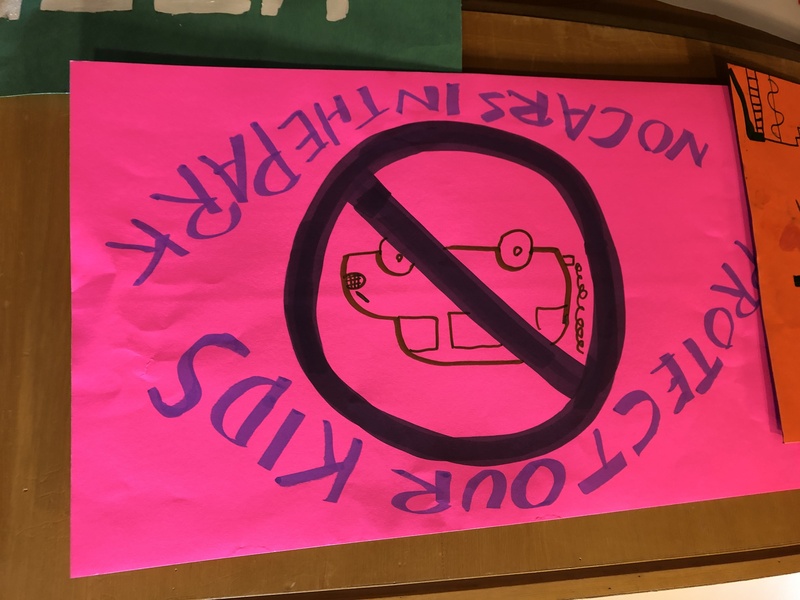 A kid’s sign hung up during the town hall demanding no cars on 78th Street. Photo: Laura Shepard. The city has not only not responded to locals’ allegations that both agencies had sold out to the car dealership — it’s been evasive to politicians, too. Officials never told Dromm that they were meeting with Koeppel Mazda about the car dealership’s desire that a portion of the street remain open for its service entrance. “They did that unbeknownst to me,” Dromm said, adding that the city claims it will keep the car-free vision for 78th Street. Update: Neither reps for the Parks Department or Department of Transportation were at the town hall, but rep Jessica Schabowski from City Hall stood up at the tail end of the meeting to tell the dwindling crowd that the mayor’s office is committed to the original project, according to Will Sweeney, co-founder of the Jackson Heights Green Alliance. The Parks Department also did not respond to a request for comment about Koeppel Mazda’s influential meetings with the agency, telling this reporter to submit a freedom of information request. Car dealerships really are the most disgusting business in the world. With complete regulatory capture because of the sales tax they provide, the immense amount of land they consume, as well as the grotesque multi-generational aristocracies they enable. Sorry, but Bill de Blasio is too busy talking to eight people in a room in Des Moines to talk to eighty people in a room in Queens. It was very interesting that someone from the mayor’s office stood up in the crowd right at the end of the event for the last comment saying the Mayor’s office is fully committed to the original plan. Would have been nice to have had that person say something earlier. It’s the de Blasio way: propose something, let everyone fight about it, say nothing for a really long time and then maybe, after everyone has wasted so much time and energy, take the temperature of the room and make a statement. Real courage on behalf of him and everyone who works for him. True leadership that’s up to the challenges we face as a city. This is par for the course for the city. They have delayed for YEARS an approved plan to improve streets near two schools in Inwood because a politically connected car wash didn’t like how it might affect his free use of swaths of public streets for queuing. The problem is politicians of both parties have this idea in their head that all business is sacrosanct. That’s undoubtedly why the car dealership got special treatment. What we need to do more of is analyze what these businesses cost the city. If they cost more in services than they generate in taxes, we should rethink the idea of bending over backwards to keep them here. I don’t know what the numbers are, but I’d say car dealerships, gas stations, parking garages, parking lots, really nearly anything having to do with motor vehicles, costs the city more than they pay in taxes. Besides the obvious externalities the motor vehicles cause with the city pays for, you have lost opportunity cost where the space occupied might generate more in taxes if put to some other purpose. We might do well in the future to just tell these businesses to move. A good start would be saturation enforcement of parking regulations near these types of businesses. When they can no longer store vehicles on sidewalks, many of them might just up and leave, which would be good thing as far as I’m concerned. Just because something creates jobs doesn’t mean it’s good overall for the city. The city may surrender a years-in-the making plan to transform a Jackson Heights street into a pedestrian friendly car-free plaza because of a well-connected, wait for it, car dealership!